The aim of the Chiltern Woodlands Project is to promote and encourage the sensitive and sustainable management of Chiltern woods in order to protect the landscape of the Chilterns and maintain and enhance its biodiversity. The Project was started in 1989 by The Chiltern Society and is now an independent charity, based in the Chilterns Conservation Board office. 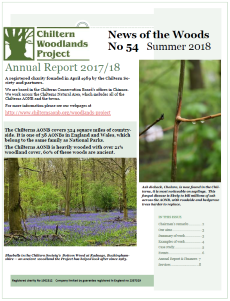 The Project promotes a sustainable woodland economy and raises awareness, understanding and enjoyment of woodlands through its regular newsletter and other publications. See a Gallery of images from the Project. Woodland Management advice (free first visit). Woodland ecological and historical assessments. Felling licence applications to the Forestry Commission. Identifying, selecting and marking trees for felling. Training, Events, Conferences, Talks & Guided walks. Type of woodland, methods of management and maintenance of trees. An assessment of the condition of the trees and woodland. A discussion on aims and objectives for the wood (s) and options. Woodland biodiversity - identification of woodland flora & fauna. Woodland archaeology - what features are present e.g. sawpits, banks. Ancient woodland management and restoration. Tree health and disease issues. Pest control - identification of likely problems and possible solutions. Timber utilisation - what trees are present and how they can be used or sold. Tree and hedge planting, protection and aftercare. Practical management such as weeding, pruning and ride cutting. Contractor contacts or other ways to implement work. There is a charge for these services. Please contact the Project Director John Morris (details below) for more information. John has over 30 years' experience advising on woodlands in the Chilterns. The Project's Business Plan and Prospectus for 2009-12 provides a good overview of the range of work it undertakes and its achievements. Advice sheet on the best ways to thin woodlands to enhance timber quality and wildlife. Management advice on the value of deadwood in woodlands. The pros and cons of leaving ivy on trees. An introduction to using a mobile sawmill to process timber. 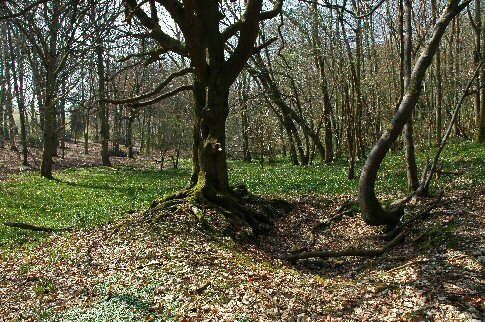 How to identify archaeological features in woodlands and avoid damaging them during woodland operations. Information on protecting bat species found in woodlands. Find out all the latest news and events in our latest newsletter. Special Trees and Woods of the Chilterns. A beautifully-illustrated full-colour 176 page book. The Cultural Heritage of Chiltern Woodlands. A fully-illustrated guide to the fascinating story of local woodlands and historic features to look for.